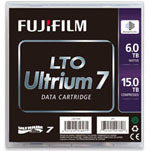 Last week Fujifilm announced that its next-generation LTO Ultrium 7 data cartridge has been qualified by the LTO technology provider companies for commercial production and is available immediately. FUJIFILM LTO Ultrium 7 has a compressed storage capacity of 15.0TB with a transfer rate of 750MB/sec assuming 2.5:1 compression ratio. This capacity achievement represents a 2.4X increase over the current LTO-6 generation. Fujifilm, a market leader in data tape technology, and achieving this qualification of it's Barium Ferrite LTO-7 is the result of our commitment to investing in this technology and bringing the most advanced data storage solutions. As the need for storing large volumes of valuable data and content continues to grow exponentially, Fujifilm is committed to delivering the high-performance and superior quality media that customers demand for cost-effective and reliable data protection. Since 2000, Fujifilm has led the development of large-capacity LTO Ultrium data tape for backup and archival applications. The upcoming FUJIFILM LTO Ultrium 7 data cartridge is based on Fujifilm’s NANOCUBIC technology and incorporates Barium Ferrite (BaFe) particles. Fujifilm’s LTO-7 achieves its increased recording density through advanced high precision magnetic particle dispersion and a thinner magnetic layer compared to LTO-6. Barium Ferrite features a high signal-to-noise ratio resulting in excellent stability and the ability to store data reliably for more than 30 years. Fujifilm’s NANOCUBIC technology with BaFe is also used in the production of large multi-terabyte enterprise data tape systems, supporting the needs of various customers in diverse industries for their large volume backup and archival needs. Fujifilm LTO-7 Tape Media now available at BackupWorks.com. Contact your account rep today at 866 801 2944 and ask about Fuji LTO-7 Data Cartridges.